Welcome to the October edition of the Leaders Bridge, CCC’s bi-monthly newsletter highlighting our leaders, events, and opportunities brought to you by the Bridges Leadership Initiative, our members and key partners. Unfortunately, we had to skip the August edition, but there are still plenty of opportunities in November! The next edition is scheduled for mid-December. Leaders, members, and CCC partners interested in sharing events and opportunities are encouraged to submit requests to: Nakisha@CoalitionCommunitiesColor.org. In 2017, Shilo George graduated from the 9th cohort of the Native American Youth and Family Center’s (NAYA) Oregon LEAD program. As a current member of the BRIDGES-Metro Community Partnership Program, owner and consultant of Łush Kumtux Tumtum Consulting, and Parent Involvement Advocate with NAYA, her leadership has broad and deep impacts our communities of color. She is grateful for her experiences with her cohort, appreciates the new skills she developed and especially cherishes the opportunity to meet amazing and inspirational Indigenous leaders. Last October, Shilo joined the BRIDGES-Metro Community Partnership Program (Metro Pilot), a collaboration between the Coalition of Communities of Color and Metro, a regional planning authority. When asked why she applied to the Metro Pilot, Shilo responded that she wanted to use her educational privilege to support and help heal American Indian and Native Alaskan community and all marginalized communities. She further acknowledged that despite having over 20 years of community service experience in a variety of settings and an advanced degree, she still faced many barriers to career advancement and civic engagement in decision-making spaces. Since joining the Metro Pilot, her enthusiasm, wisdom, and commitment to removing systemic barriers that limit our communities. As owner and consultant for her business, Łush Kumtux Tumtum Consulting—pronounced: thlush comeducks dumbdumb, a Chinuk Wawa phrase meaning "a great awakening of the heart and spirit"—Shilo will soon be facilitating a work session for Metro employees that will cover trauma-informed practices for diversity, equity, and inclusion. She also recently joined a panel consisting of Metro’s community partners and spoke to Metro’s communications staff on best practices for engaging with our communities. During this panel, Shilo articulated a number of meaningful insights. Shilo’s civic leadership is informed by her work as a Parent Involvement Advocate at NAYA. Through bridge building between parents, teachers and administrators, and external services she provides direct support to Native American families as they develop skills, knowledge, and abilities to ensure their children succeed in the educational system, heal from personal and historical trauma, and dismantle systems of oppression. Please join us in extending congratulations toDr. Connie Kim Yen Nguyen-Truong, API-CLI Alum from Cohort I, who was recently awarded the R. Davilene Carter Presidential Prize for Best Manuscript from the American Association for Cancer Education! Dr. Nguyen-Truong led community-based participatory research from the Vietnamese Women's Health Project in partnership with the Immigrant & Refugee Community Organization’s Asian Family Centerand community-at-large on disparities in cancer screening. She was the primary author of the highly regarded manuscript. Co-authors were Ms. Chiao-Yun Hsiao, BS, a former program coordinator with IRCO’s Asian Family Center and field organizer with APANO in Portland, and Ms. Victoria Demchak, MRP, was previously a policy coordinator with APANO. The hard work and perseverance of these three professionals have a lasting impact on our communities. The paper will also be published in a scientific journal - Progress in Community Health Partnerships: Research, Education, and Action). Please read more about Connie’s meaningful workon Washington State University’s College of Nursing site. Dr. Connie Kim Yen Nguyen-Truong, PhD, RN, Alumnus PCCN, is an appointed Senior Advisor member of the API-CLI Steering Committee, an elected Co-Chair of the Immigrant & Refugee Community Organization (IRCO) Asian Family Center Advisory Board, and an elected member on the IRCO Board of Directors. She is an Assistant Professor at Washington State University College of Nursing in Vancouver. She is Asian American and Vietnamese bilingual, bicultural. Being a Nurse Scientist and an Educator, she is committed to excellence in conducting community-based participatory and community-engaged research with community and academic partners to improve the health of Asian and Pacific Islander Americans. She has a combined 18 years of expertise and experience in clinical nursing and population health nursing and a decade of engagement with communities of color including immigrants and refugees since 2006, as a nurse scientist, volunteer nurse clinician, a collaborator at several health outreach events, and leadership advisory roles at community-based organizations. The Coalition of Communities of Color advocates for ballot measures that are in alignment with our mission to address the disparities, racism, and inequity of services experienced by communities of color, and to seek social change so we can obtain self-determination, justice and prosperity. Download our one-page voter guide to find out what measures CCC endorses, and which ones we are fighting. The positions contained in the guide represent the positions of CCC as a coalition and not individual members. Learn more about CCC’s endorsement process and what it means here. There are only a few more days left for Portland to vote on initiatives that are critical to our health and well being. November 6th is election day!Your participation can stop hurtful and hateful measures and help turn proposed solutions for our communities into reality. PORTLAND CLEAN ENERGY INITIATIVE PHONEBANKING! The Portland Clean Energy Initiative will advance environmental justice by funding job training, healthier homes, renewable energy, and green jobs to build citywide resilience and opportunity with an emphasis on underserved communities, including communities of color. Calling voters across Portland is a crucial step to ensure that we win on November 6. Pizza, snacks, and a training will be provided, so newcomers and first-time phone-bankers are warmly welcome! This is your movement! Sign up here. 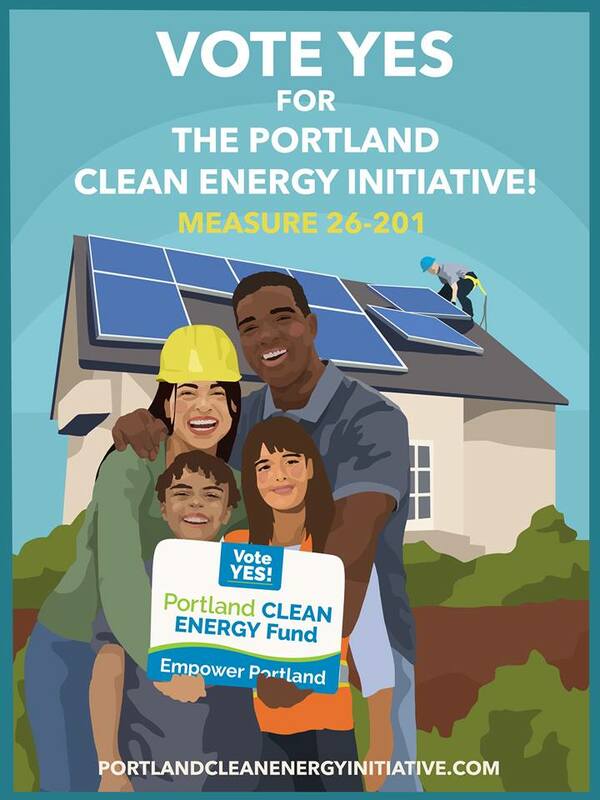 When: Next Monday & Tuesday, Nov. 5th & 6th, 4:30-8:00 p.m.
CANVASS FOR THE PORTLAND CLEAN ENERGY INITIATIVE AND NO ON MEASURE 105! Everyone is joining forces to knock, talk, and change the world! Going door-to-door to talk to voters (canvassing) is proven to be the most effective way to spread a campaign message and win. Training is provided, so newcomers and first-time canvassers are warmly welcome! Over the next few days we will canvass on PCEI and to stop statewide Ballot Measure 105 (M105). Measure 105 eliminates Oregon’s existing sanctuary law that reduces racial profiling and prevents misuse of local resources from being used to enforce federal immigration law. By repealing Oregon’s 30 year old sanctuary law, this measure directly attacks communities of color and immigrants. It will make our communities less safe, open the door to racial profiling, and result in more families being torn apart. Plan to meet at campaign headquarters, which is at Sierra Club (1821 SE Ankeny St., Portland). But on Saturday, canvassers will meet somewhere in the field; you will receive details about where and when to meet when you sign up! Monday, Nov. 5 (ALL DAY) — THREE SHIFTS! Tuesday, Nov. 6: ALL DAY BALLOT COLLECTION — THREE SHIFTS! APANO will be open every day November 1-6 from 9:00 am-7:00 pm to assist voters, collect ballots, and make sure your vote is counted. Only 25% of the state has voted so far.Help your neighbors and friends bring their voices through voting. Celebrate the campaign for clean energy with the community that got us this far--and will continue to make waves for climate justice in Oregon. RSVP on Facebook. The BRIDGES Leadership Development Initiative is currently collaborating with Oregon Futures Lab and a handful of our members to host a power building training and discussion on how we shift from campaign mode to cross-cultural governance. After the Nov. 6th election, we will all need to continue working together as a community to hold our electeds accountable to the issues CCC and our members and friends are championing, build power, and develop authentic relationships between and among our communities and electeds of color across jurisdictions. The academy is scheduled to occur 9am-3pm at the NWHF offices, with a Happy Hour and Social at a nearby location from 3pm-5pm. Mark your calendars and stay tuned for an invitation to this important leadership event! Latino Network will host its ever popular Holiday Open House. Join their holiday celebration and indulge in great food, delicious drinks, and the company of good friends, colleagues, staff, and supporters. Mark your calendars. We hope to see you there! BRIDGES Alumni and Current Cohort: Are you ready to develop and enhance your relationships with other graduates from the BRIDGES program? Do you want to advance cross-cultural collective action and coordinate with one another to create meaningful large-scale systems change and progress for racial justice? Then mark your calendar for December 8th, when we hold the BRIDGES Kickoff to our Cross-Cultural Quarterly Convenings for Collective Action! The Oregon Health Authority is now accepting nominations for the Health Information Technology Oversight Committee (HITOC). Nominations are due November 9, 2018. HITOC members participate in health system transformation by working towards a vision of health IT-optimized health care, in which robust Health IT (HIT) tools support providers, patients and their families, and many stakeholders. HITOC establishes the strategic plan for HIT for Oregon, making policy recommendations, assessing the HIT landscape, and programmatic oversight. HITOC reports to the Oregon Health Policy Board, and membership is set by the Board. The Oregon Health Policy Board is committed to ensuring all committees reflect the racial, ethnic, gender, and geographic diversity of Oregonians. They are looking for motivated leaders with health IT expertise and are especially interested in nominees with health IT experience in Behavioral health (both mental health and substance use disorder treatment), Consumer/patient advocacy, Tribal health, Social determinants of health and equity, and more! Details regarding service and application requirements are available online. BRIDGES Jobs and Leadership Openings online! Executive Director - Rebuild Center - Closes November 15! With a three-year strategic roadmap now in place, including a shared vision of “equity and reuse everywhere,” and the 20th anniversary of our North Mississippi Avenue store approaching in 2020, the ReBuilding Center seeks an experienced, passionate, and dedicated Executive Director to help us continue to make a material difference in Portland and beyond. Please click the button below to read the full job description and application process details. Salary range: $80,000 - $100,000 Depending on Experience. For additional details about this position and how to apply, see the announcement on our BRIDGES online Jobs and Leadership Openings page. Verde is Hiring Crew Managers! Join the Verde team as a Landscape Crew Member! Verde is seeking crew members to support their landscape maintenance, irrigation, and stormwater responsibilities. No experience necessary. Drivers license preferred. Apply online, or fill out a paper application at our office at 6899 NE Columbia Blvd Suite A, Portland, OR 97218. LATINO NETWORK IS HIRING FOR SEVERAL POSITIONS! Latino Network seeks a bilingual, bi-cultural mission-driven professional with experience in recruiting youth and implementing leadership development programs with middle and high school-aged youth. This position will also work to develop and lead a new Culturally Specific School Navigator position at David Douglas High School working with male Latino youth and their families. The School Navigator/Health & Wellness Program Specialist will work closely with the management and other staff to coordinate and implement programs for youth. The candidate has proven skills in providing case management for youth and engaging families in the school community, as well as experience, designing and running groups. This is a roll-up-your-sleeves position with the capacity to impact the health and wellbeing of Latino youth. CLOSING DATE:Open until filled; Compensation:$32,300-$40,700 Annually or $15.53-$19.57 Hourly 1.0 FTE Non-Exempt. For additional details about this position and how to apply, see the announcement on Latino Network’s Jobs page. The P-3 (Prenatal 3rd grade) Coordinator is charged with supporting the SUN Site Manager and Principal to increase and deepen diverse parent-centred family engagement and leadership at the school. CLOSING DATE: Open until filled; COMPENSATION: $32,300-$40,700 Annually or $15.53-$19.57 Hourly 1.0 FTE Non-Exempt. For additional details about this position and how to apply, see the announcement on Latino Network’s Jobs page. The Successful Families 2020 Program Lead works as a part of a collaborative and energetic team to implement a high quality, culturally inclusive family and youth engagement program. Latino Network seeks a bilingual, bi-cultural mission-driven professional with proven nonprofit and community experience to lead a full range of activities for a growing organization. Key prior experience includes; coordinating services with other agency partners to provide high quality services to families, building relationships with school staff and administrators, building relationships with students and families. CLOSING DATE: Open until filled; COMPENSATION: $32,300-$40,700 Annually or $15.53-$19.57 Hourly 1.0 FTE Non-Exempt. For additional details about this position and how to apply, see the announcement on Latino Network’s Jobs page. For more job openings at Latino Network, visit their Jobs Page. As an Assistant Guest Services Manager, your responsibilities are all about enhancing the guest experience at our venue while continually leading and developing an engaged staff. This newly developed role will support the Guest Services Manager in shaping a new direction for our operations while ensuring that our well-established organization continues to be an industry leader. Deadline to apply: November 15, 2018 @ 5:00 pm; Salary:$48,274.00 - $69,999.00 annually. For additional details about this position and how to apply, see the announcement on the BRIDGES online Jobs and Leadership Openings page. The Public Health Division of the Oregon Health Authority is recruiting for an Environmental Health Education and Equity Specialist to develop and implement culturally-responsive health education materials and interventions for the Environmental Public Health section to reduce environmental exposures in Oregon communities. The Environmental Public Health Section identifies, assesses and reports on threats to human health from exposure to environmental and occupational hazards, and advises the people and communities of Oregon to best understand potential risks where they live, work and play in order to remain healthy and safe. Closing: 11/19/2018 11:59 PM; Salary: $4,016.00 - $5,872.00 Monthly. For additional details about this position read the announcement on BRIDGES online Jobs and Leadership Openings page. The Public Health Division of the Oregon Health Authority is seeking an Environmental Health Assessment Program Coordinator to coordinate the activities of the Oregon Environmental Health Assessment Program (EHAP) and to administer the federal grant that funds the program. The Environmental Public Health Section identifies, assesses and reports on threats to human health from exposure to environmental and occupational hazards, and advises the people and communities of Oregon to best understand potential risks where they live, work and play in order to remain healthy and safe. Closing: 11/19/2018 11:59 PM; Salary: $4,221.00 - $6,162.00 Monthly. For additional details about this position read the announcement on BRIDGES online Jobs and Leadership Openings page. CCC Member Voz, is looking for volunteers to help dispatch jobs at the Worker Center. This is a great way for volunteers to get introduced to Voz's work and meet the day laborers. To volunteer, please sign up! Welcome to the June edition of the Leaders Bridge, CCC’s bi-monthly newsletter highlighting our leaders, events, and opportunities brought to you by the Bridges Leadership Initiative, our members and key partners. Given the abundance of spectacular events, celebrations and career and placement opportunities, we are so excited for this edition of the newsletter! The next edition is scheduled for mid-August. Members and Key Partners who are interested in sharing events and opportunities are invited to submit requests to: Nakisha@CoalitionCommunitiesColor.org. Jacqueline “Jackie” Leung is an active member of her community and graduate of the Asian Pacific Islander Community Leadership Institute (API-CLI). She is also a mother, community organizer, chairperson, supervisor to community health workers, and beginning in January 2019, Salem City Councilor! Jackie earned her Juris Doctorate from Willamette University College of Law. She also has a Masters of Science in Community and Behavioral Health from the University of Iowa College of Public Health. Jackie is a graduate of the 4th cohort of the API-CLI program. She was drawn to the program because she wanted to strengthen her organizing and advocacy skills as a means to address human rights, immigration justice, and diversity, equity and inclusion—especially with members of Asian and Pacific Islander communities. While working on a project focused on Community Organizing with her API-CLI cohort, Jackie learned to build community partnerships and effective team building strategies with a diverse leadership group. Jackie combines her knowledge of the law, health, and community organizing with her API-CLI experience to meet the health needs of the Micronesian Islander community and members of the community who identify as persons of color. She works with communities as a Community Health Worker Supervisor and Board Chair at the Micronesian Islander Community, an organization that promotes leadership, social justice, and preservation of the Micronesian Islander culture. Jackie also works as a Community Organizer with the Asian Pacific American Network of Oregon. Ms. Leung continues her civic engagement as an active member and supporter to several nonprofits and government entities including the Hunger-Free Leadership Institute; a member of Salem Mayor’s International Council; Commissioner of the City of Salem’s Human Rights and Relations Advisory Commission; Commissioner with the Oregon Commission on Asian and Pacific Islander Affairs; and the Oregon Hunger Task Force. She also participated in the Developing Equity Leadership through Training and Action (DELTA) program facilitated by the Oregon Health Authority’s Office of Equity and Inclusion. Last year, Stefan Saing not only graduated from the Asian Pacific Islander Community Leadership Institute (API-CLI), he also became a co-lead for the program! He was born to Cambodian immigrants who came to America in during the late 70s and early 80s. He graduated from Oregon State University with a Bachelor's of Science degree, majoring in Microbiology and a minor in Chemistry. He was regularly involved with the Cambodian Student Association and other student groups in college. Following a volunteer mission to Cambodia in 2013, he shifted from his focus in medicine and became interested in public health policy and education. His work has ranged from coaching youth basketball to tutoring in the sciences to community involvement. The API-CLI program was meaningful to him for many reasons, including its role is empowering Asian communities. The 2016 Cohort he was part of explored and developed leadership opportunities to support and advocate for increased civic engagement; build collaborative alliances among API communities and other communities of color in the greater Portland metropolitan region; and, focused on identifying and working towards rectifying racial and ethnic disparities. Stefan endeavors to develop a community where younger generations are able to thrive under strong leaders. He envisions a future where these youths become leaders that represent Asian and Pacific Islander communities, along with numerous historically underserved communities he and his peers collaborate among. Stefan seeks to inspire people of all backgrounds to find a role and add their own strengths to their communities. Stefan’s civic leadership includes shaping goals and outcomes of Metro’s Southwest Corridor Equitable Development Strategy (SWEDS) via his appointment to the SWEDS Project Oversight Committee; serving as member of the Board of Directors with the Cambodian American Community of Oregon; acting as a Cambodian Community Liaison for the Community Engagement Liaison Services); and part of the Planning Committee for the Cambodian, Lao, Thai, and Burmese New Year in the Park event held in Glenhaven Park annually. Details: Together we're building the power of our communities for racial justice across cultures. Summer Soirée is our chance to come together as one community for an evening of conversation, idea sharing and inspiration. Staff of CCC Member Organizations ’and Bridges Leaders can purchase tickets for $35. Use “Member” code to purchase tickets ONLY if you are a staff member or leader from a Bridges Leadership Development program. Bridges alumni are also welcome and encouraged to attend as volunteers, who can attend free of charge. Please contact Nakisha to sign up for volunteer opportunities. Nakisha@coalitioncommunitiescolor.org. Details: Juneteenth, also known as Juneteenth Independence Day or Freedom Day, is a holiday that commemorates the June 19, 1865 announcement of the abolition of slavery and the emancipation of African American slaves. Juneteenth commemorates when U.S. soldiers brought word of President Lincoln’s Emancipation Proclamation to Galveston, Texas, two years after it was issued. It is the oldest celebration of the end of slavery in the United States. In Oregon, Juneteenth OR Celebration was founded 45 years ago by the late and beloved community leader Clara Peoples. The celebration starts with a parade, followed by the festivities which include live music, art, food, educational booths, cultural booths, and a children’s play area. Where: The parade begins at the North Park Blocks and ends at Tom McCall Waterfront Park. Details: On Sunday, June 17th from 10am-3pm Latino Network will be participating in the Portland Pride Parade! You are invited to walk with us as we join our fellow Latinx and LGBTQ+ communities to support equality for all! This year, we have a truck, music, traditional folk dancers, and so much more! Light refreshments, pan dulce and snacks will be available. It’s going to be a party, so bring your family and friends for this amazing event! For more information visit the Parade FAQ site. You are invited to the Grand Opening Celebration for the long-awaited Cully Park in Portland's Cully Neighborhood. This FREE event includes food, games, and activities for all ages. Cully Park is the culmination of a partnership between Verde, a Cully based non-profit that serves communities by building environmental wealth, and Portland Parks & Recreation to turn a landfill into a 25-acre park in one of Portland’s most park-deprived neighborhoods. Bring the family, spend time with your neighbors, and help us celebrate this incredible park. We hope to see you there! Details: The Urban League of Portland is proud to support this year’s festival, which will bring over 5,000 Pan Africans and supporters in Oregon to Portland’s Pioneer Courthouse Square for a day to enjoy live music, dance, food and entertainment, health education, education and career awareness, financial literacy, and relevant other opportunities for people to get involved and take action to solve problems in their community. The Grants Manager is currently seeking up to 3 community members for this committee. The seats are open to all of our Bridges Leaders, including Metro Community Partnership Pilot participants, and Leaders who worked on the Regional Waste Plan. Interested leaders should immediately contact Nakisha@CoalitionCommunitiesColor.org, please include Metro Grant Selection Committee in the subject of your email. The Commission is currently accepting applications for membership! The Human Rights Commission works to eliminate discrimination and bigotry, to strengthen inter-group relationships, and to foster greater understanding, inclusion and justice for those who live, work, study, worship, travel and play in the City of Portland. In doing so, the Commission is guided by the principles embodied in the United Nations Universal Declaration of Human Rights. The Commission is comprised of 15 members representing a broad spectrum of the community. Members must live, work, worship, or be enrolled in school within the City of Portland. The Commission encourages applications from youth and students for up to two positions on the Commission. Human Rights Commissioners are appointed by the Portland City Council and are volunteers who work without compensation. Applications can be submitted via MSWord, or a fillable PDF form. For additional details regarding this opportunity, see the description on the Bridges Jobs and Leadership Openings Site. The Coalition of Communities of Color is hosting the Port of Portland’s Environmental Justice seat for their PDX Community Advisory Committee. Raise public knowledge about the airport and impacted communities. A key focus of the committee will be to work towards assuring that PDX and the Airport Plan District become the most sustainable in the world recognizing the long-term, critical interconnection between economic development, environmental stewardship, and social responsibility. The PDX CAC meets four times a year at Portland International Airport, usually on Wednesdays, from noon- 3:30 pm. Parking is paid and lunch is provided. The next meeting is on Thursday, June 14, 2018. Interested candidates are welcome to attend this meeting as members of the public. 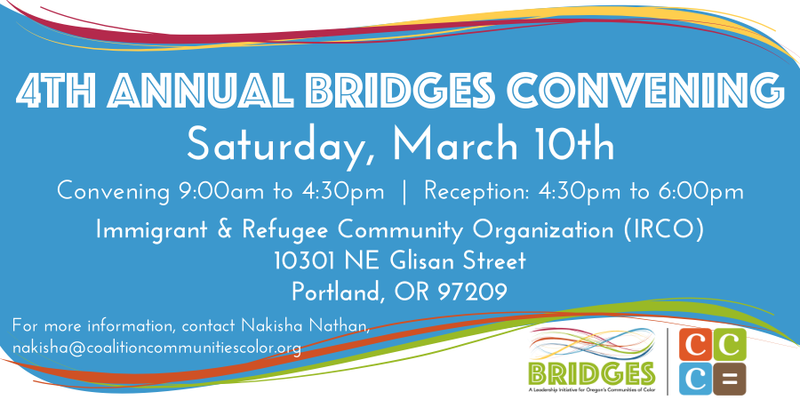 Interested leaders should contact Nakisha@CoalitionCommunitiesColor.org, and use PDX CAC Inquiry in the subject line of their email. The City of Portland's Office of Equity & Human Rights (OEHR) is looking for an Equity Training and Education Program Coordinator to join their team! The Equity Training and Education Program Coordinator is responsible for creating, managing, and developing equity training and education activities, targeting all City staff and elected officials. The program provides training to all City staff on how to cultivate an Equity Mindset and understand how to use an equity thought process in their work. The training program primarily centers on racial equity and disability equity. This position will be responsible for supporting program goals and objectives; Will work closely with the City Tribal Liaison in the Office of Government Relations to design training contents and facilitate training sessions that are specific to Tribal history and culture, tribal governance, treaties, and law. Co-develop strategies and best practices toward improving engagement and working with the Portland American Indian/Alaska Native community. For more details about this job opportunity, see the description on the Bridges Jobs and Leadership Openings Site. The Portland Housing Bureau is recruiting for a Neighborhood Housing (NH) Manager responsible for providing comprehensive planning and coordination of homeownership, home repair, and homeowner retention programs within the Portland Housing Bureau (PHB). The NH Program Manager leads the team in the development and implementation of programs, City and Bureau policy, and partnerships with non-profit partners to assist in providing related services in the community. The position oversees high-level compliance activities to ensure programs and resources are effective in creating opportunities to help communities with lower rates of home buying access and retain the benefits of homeownership. 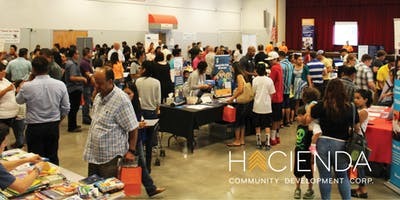 This includes, but is not limited to budgeting, tracking and evaluating program performance against established goals, and working with community partners in identifying and implementing new strategies to increase homeownership for low-income households and help homeowners at risk of displacement to retain their homes. For more details about this job opportunity, see the description on the Bridges Jobs and Leadership Openings Site. If you are a strategic thinker, someone who loves public policy, and a fighter for economic justice, this position may be right for you. The Oregon Center for Public Policy (OCPP or the Center), the leading public policy research institute in Oregon, seeks an Executive Director with a passion for advancing progressive state fiscal and economic policies that benefit all Oregonians. The Executive Director will oversee the Center’s high-quality research and analysis work; manage staff and operations including leading fundraising; maintain and build coalitions to advance strategic economic agendas; advise the legislature, state government, political influencers, and the public on priority issues; and ensure that the organization has the resources and support to achieve the mission. For more details about this job opportunity, see the description on the Bridges Jobs and Leadership Openings Site. This position is part of the Native American Youth and Family Center Community Development Department’s Housing to Homeownership Program. The Homeownership Coordinator will work in collaboration with other agency programs to provide support to potential homeowners in Portland’s Native American community. This position is responsible for providing culturally specific and HUD-approved homeownership coaching and homebuyer education workshops for low- to moderate-income program participants. The coach helps buyers identify their goals and needs, evaluates individual financial situations and homeownership goals in order to provide the appropriate resources and educational support. Budget oversight, direct participant service and case management, regular workshop coordination, and event coordination are fundamental activities of this position. This position will play an administrative leadership role with the Minority Homeownership Assistance Collaborative, a coalition of affordable housing agencies collaborating together to deliver programmatic services. For more details about this job opportunity, see the description on the Bridges Jobs and Leadership Openings Site. The Native American Youth and Family Center (NAYA) is looking for a motivated, organized, creative, and resourceful individual to serve as its Cully Boulevard Alliance District Manager. The Cully Boulevard Alliance (CBA) exists to promote and foster opportunity for economic prosperity that embraces diversity, nurtures community, and empowers Cully residents. Our shared vision is to see community-rooted businesses forming, growing, and thriving in a diverse neighborhood committed to serving and responding to the hopes and dreams of its residents. The CBA District Manager will oversee community economic development primarily targeted on NE Cully Boulevard between NE Freemont and NE Killingsworth St., one of the Prosper Portland Neighborhood Prosperity Initiative Zones. For more details about this job opportunity, see the description on the Bridges Jobs and Leadership Openings Site. Latino Network seeks a mission-driven professional with proven nonprofit and community experience to provide finance support. This is a roll-up-your-sleeves position with the capacity to impact the lives of Latino youth and their families. If you are caring, resourceful, outcome-orientated and able to build strong relationships, then Latino Network is the place for you. Primary responsibilities consist of financially coordinating a portfolio of agency contracts and private grants by ensuring the accuracy of accounting codings, ensuring costs are allowable, completing monthly invoicing in a timely fashion, and adjusting budgets as necessary. All tasks to be performed in accordance with Generally Accepted Accounting Principles and agency policies and procedures. For more details about this job opportunity, see the description on the Bridges Jobs and Leadership Openings Site. The Communications Development Associate will work with the Development Coordinator and Director of Development & Communications to carry out public relations/communication strategies that enhance IRCO’s public image including coordination of IRCO’s policy and advocacy efforts and additional tasks associated with the Development team. This position will play a key role in writing, producing, and disseminating agency-wide marketing materials and communications to diverse audiences. This position will participate in meetings, training, and committees to support IRCO’s goals and objectives. The Metro Central enhancement grants program has begun accepting applications, they are due in September. This program supports residents within a target area that stretches along the west side of the Willamette River from the Northwest Neighborhood Association to Linnton, along with an area around the St. Johns Bridge within North Portland’s Cathedral Park neighborhood. Grants are awarded on an annual basis by the Metro Central Enhancement Committee, made up of representatives from the surrounding neighborhoods, businesses and environmental community. In 2018, the Metro Central Community Enhancement Committee funded 12 local improvement projects totaling $246,717. The City of Portland Bureau of Planning and Sustainability (BPS) will host a listening session on Thursday, June 21 to hear from individuals interested in providing or expanding services in Portland’s waste and recycling industry. BPS wants to hear about experiences, challenges, and ideas for change. The event will include food, drinks, a $50 gift certificate, and interpretation services upon early request. BPS is committed to increasing accessibility for people of color in Portland’s waste and recycling industry. BPS wants to understand barriers to entry and identify steps to reduce those barriers. BPS is specifically seeking participation from communities that may have experienced barriers to entering the waste and recycling industry, including women, communities of color, immigrant communities, the LGBTQ+ community, and all faith or religious communities. No documentation or validation of participants’ identity will be requested. Please contact Alfredo Gonzalez at alfredo.gonzalez@portlandoregon.gov or 503-823-8330 by June 13 at 5 p.m. Limited number of gift certificates available. The listening session will be held Thursday, June 21 from 5:30 p.m. to 7:30 p.m. in East Portland. The City of Portland is committed to providing meaningful access. For accommodations, modifications, translation, interpretation or other services, contact 503-823-7700, the TTY at 503-823-6868 or the Oregon Relay Service at 711. For additional information see the attached flyer. The Environmental Protection Agency is holding its first quarterly Portland Harbor Public Forum on Wednesday, June 13th2018 where community members can learn about current and planned work at the Portland Harbor Superfund site. You can find the most current information about the Public Forum at the Portland Harbor cleanup website.RSVPonly if you would like to receive event reminders. You do not need to RSVP in order to attend. *Food from Tamale Boy will be provided by the Pre-Remedial Design Group and will be served on a first-come, first-served basis. Gluten-free and vegetarian options will be available. You are encouraged to arrive early to make sure you have food before the meeting starts promptly at 6 PM. What will I learn at the Portland Harbor Public Forum? Do you or someone you know needs language interpretation? Please contact Laura Knudsen by May 30, 2018 (knudsen.laura@epa.gov, 206-553-1838). Póngase en contacto con Laura Knudsen (knudsen.laura@epa.gov, 206-553-1838) antes del 30 de mayo si necesita servicios de interpretación. Vui lòng liên lạc Laura Knudsen (knudsen.laura@epa.gov, 206-553-1838) trước ngày 30 tháng 5 nếu bạn cần dịch vụ thông dịch. Fadlan la soo xiriir Laura Knudsen (knudsen.laura@epa.gov, 206-553-1838) kahor 30-tii May haddii aad u baahan tahay adeegyada tarjumaadda. Details: This panel and roundtable discussion will invite guest speakers to share thoughts on contemporary issues facing people who identify as queer and API. How do we navigate API spaces as queer people? How do we navigate queer spaces as API people? What areas present conflict or othering, and how do they impact health and approaches to self-care? Participants will be encouraged to listen, reflect, and share experiences and resources as they are comfortable. Details: This popular procession is more than a spectacular floral-filled parade; it’s a beloved annual tradition. For more than 100 years, Portland families, visitors and community groups have been making memories at the Spirit Mountain Casino Grand Floral Parade. A colorful reflection of local, regional and international communities, the parade draws hundreds of thousands of cheering viewers of every age, along a 4-mile route that winds through city streets and across the river. The 2018 Spirit Mountain Casino Grand Floral Parade will begin at 10:00 a.m. on June 9. Details: Kúkátónón performers feature West African dance and drumming, a special ballet presentation, and guest performances by Habiba Addo [Ghanaian storytelling and vocals], Habib Iddrisu [Ghanaian drumming], and Obo Addy Legacy Project [Ghanaian drumming and dancing]. Details:This June the Whitenoise project for our second event in the De-Canon Residency and Pop Up Library is excited to host powerhouse out of town poets Sokunthary Svay, Do Ngyuen Mai and Hari Alluri as they visit our fair city, as well as local favorite Armin Tolentino! The Whitenoise Project is a reading and discussion series aiming to center voices from underrepresented communities (PoC, Queer, Femme, WoC and people with disabilities), and is supported by a Jade-Midway Placemaking Grant from APANO. Details: Invisible Spectrum Stories is back for 4 shows this year! We kick off our first show of 2018 in Pride month, featuring storytellers from our community workshop and LGBTQ storytellers. Invisible Spectrum stories features storytellers of color in Portland, and our theme is IDENTITY. Claiming it back. Finding it. Discovering it. Seeing it from the other side. Seeing someone else’s identity. Who are we. And choosing who I am. Details: How do we overcome cultural silences around mental health in communities of color? How do we move away from the perception that we are broken and in need of fixing? Using generative writing exercises, we will mine memory, family history, and fractured narratives of the self to build writing practices rooted in compassion and imagination. Open to all levels of writers. Details:Bring your friends and family to explore the diverse entrepreneurial talent of Portland at this FREE annual event. Support the community and shop at over 80 local multicultural businesses, talk with vendors, and network with local business owners of color. There will be live music, art, performances, and of course, plenty to eat and drink from some of Portland’s best eateries. Welcome to the May edition of the Leaders Bridge, a bi-monthly enewsletter highlighting our leaders, events, and opportunities brought to you by the Bridges Leadership Initiative, our members, and key partners. I joined the Coalition and the Bridges Leadership Development Initiative as the new Leadership Development Director two months ago. Within a few weeks of starting, the Bridges team introduced me to their programs and helped set the stage for the Annual Bridges Leadership Convening held on March 10th. It was great to get to see so many powerful leaders so soon after starting with the Coalition. If you weren’t able to make it, find out more about this meaningful, informative, and fun event, HERE!! CCC will continue to develop and utilize tools within the Bridges Directory to share more opportunities for leaders to network, support and learn from one another, access meaningful jobs, and find opportunities to apply for placement on boards councils and commissions. The Bridges Directory is an online platform for Bridges alumni and participants to share their skills and interests with each other and with trusted partners who value our leaders and are committed to equity. If you are a current cohort member or Bridges Alumni, you can set up or update your profile here. The directory is not only a place to highlight your experience, it’s also a place to find out about jobs and openings in decision-making spaces, and stay updated about the myriad of events hosted by the Coalition, our members, and key partner organizations. We’re also working on expanding the functions offered on the Bridges Directory. Potential options include posting resumes, sharing resources for professional development by uploading documents or posting articles, or even using the Groups tool, which functions like an online forum and serves as a space people can collaborate and post discussion topics, photos, and or hold polls! The Leaders Bridge will be published on a bi-monthly basis and each edition will also provide key leadership and civic engagement opportunities, board openings, and career opportunities. The newsletter features important dates, spotlight one or two current and past participants of the leadership programs, and highlight one of our member organizations and or their staff. If you want to spotlight a Bridges alumni or current cohort member, please contact me via email: Nakisha@coalitiocommunitiescolor.org! Combined, the Bridges Directory and the Leaders Bridge will deepen connections and transform best practices for engagement between Bridges leaders, staff, and our community partners. Speaking of partners—If you are one of our valued partners or a Bridges leader working with an organization, business, or governmental agency and want to share an event your coordinating, a job opening, make sure you update your Bridges Profile in the Directory and then post your event or job there. I’m looking forward to learning more about the amazing work of our members, the leadership development programs, and most of all our leaders, staff and partners. Bridges Leaders and supporters may have met Carmen Rubio in her capacity as a transformational leader and Executive Director at Latino Network. She was recently recognized in the Portland Business Journal’s 2018 Women of Influence list! Carmen was a participant of Latino Network’s first cohort of Unid@s leadership development program, she was also its founder! Carmen first explored the development of the program because she had a vision about potential of the collective impact of Latino leaders in Oregon. She realized that Oregon was rich with talented, powerful and influential members of the Latino community and that as the community grows, so should its power, influence and support for one another. So in partnership with other community leaders, Carmen worked to create a program to unite Latino leaders, to build their collective power, and ultimately to improve the well-being of Oregon’s Latinos. One of the most memorable and exciting experiences during the first Unid@s program was her cohort’s production of The Oregon Latin@ List. This heartening video celebrates the childhood stories, values, hopes and lessons that influence the leadership of the first Undid@s cohort. The voices of these leaders and many more continue to be heard as the leadership program is preparing to graduate its 6th cohort this June! Born and raised in Hillsboro, Oregon, her maternal grandparents worked as Braceros, migrant farmworkers, from Durango, Mexico and were among the first Mexican-American families to settle permanently in the Hillsboro area of Washington County. Carmen was a first generation college student who became increasingly active organizing in student unions like MEChA and student government at the University of Oregon, and volunteering on political campaigns. Her commitment to social justice, advocacy and civic engagement informed her decision to study political science. Upon graduation, she worked for Milagro Theater and Metropolitan Group before joining the campaign as Field Director for a young Latina candidate. She has served as staff for Multnomah County Commissioner Serena Cruz, Portland Mayor Tom Potter, and Portland Commissioner Nick Fish, and she joined Latino Network as its Executive Director in 2009. Carmen believes that her ability to choose her own career was a privilege due in large part to her family’s choices, she also understands that the choices currently being made impact future generations. Her mission to amplify and advance the strength and courage of the Latino community is fueled by the diversity of leaders, allies and community members who know the value of investing in people and in institutional change for social justice. Carmen currently serves on the boards of the Oregon Shakespeare Festival, Coalition of Communities of Color and the University of Oregon Alumni Association. She is a 2015 Marshall Memorial Fellow, an American Leadership Forum of Oregon Fellow, and a member of the International Women’s Forum. She also serves as an appointed Commissioner on the State of Oregon’s Higher Education Coordinating Commission, where she strives to elevate the voices of underrepresented students and students of color enrolled in Oregon’s public colleges and universities. Bridges leaders and alumni had the opportunity to experience Robin’s leadership in action during her keynote presentation and workshop facilitation at last month’s 4th Annual Bridges Convening. Robin graduated with the first cohort of the African American Leadership Academy (AALA, 2013). While participating in the AALA’s leadership development program, Robin developed a community based project that focused on the gentrification of the historical Black Community and the contributing role of the city’s current and past policies and practices. A clear and memorable learning moment occurred when, as a collective, her PAALF Leadership Program peers committed to understanding their shared and unique experiences through a shared framework and lens. Robin cherishes the personal connections developed while participating in AALA, especially because the formation and cultivation of those relationships helped her navigate through institutional racism and overcome barriers she faced as a woman of color. So, as the Director of Equity Avancement with the Center for Equity and Inclusion, Robin continues to build important connections with, between and among her community and organizations. Additionally, she provides executive level coaching to ensure the success of infusing equity broadly and deeply throughout organizations, recognizing the importance of connecting organizational leaders to the development and process of creating their equity and inclusion plans. Robin loves that the Coalition’s Bridges Leadership and or AALA Program provides an opportunity for each emerging or refining leader to be immersed in a culturally specific program that fits their unique needs. Personally, she hopes that her development as a leader continues to grow and deepen, and that her perspective continues to be broadened and deepened by linking arms with those around her. Please join us in celebrating our successful pilot project and the launch of the next phase of the Coalition's work with a brief celebratory reception directly in advance of our report to City Council on Thursday, May 3rd. We would welcome your presence and support at the Reception (1-2pm) and or at our Report to City Council (2-4pm). During the reception, there will be food, drinks, a photo booth and we’ll hear a few words from Commissioner Chloe Eudaly! This will be a great opportunity to learn more about PUAH, show your support and network with the coalition’s members. Please RSVP. The following opportunities were shared with us by, John Gardner, Director of Diversity & Transit Equity, TriMet Department of Diversity & Transit Equity. Transit Equity Advisory Committee (TEAC): TriMet is expanding the membership of TEAC. The Goal of the Transit Equity Advisory Committee (TEAC) is to provide insights, guidance, and recommendations to the General Manager on transit equity, access and inclusion issues. Members advocate for the concerns, issues, and challenges faced by low income, minority, underrepresented, transit dependent and other vulnerable populations they and their organizations represent. TEAC provides a forum for the review and discussion of all aspects of TriMet service, including but not limited to service planning, Title VI, Environmental Justice, operational and capital investments, safety, security and workforce. Interested organizations are encouraged to contact John Gardner for more information. Safety & Security Advisory Committee: TriMet’s forming a new committee to ensure for greater equity and transparency related to Fare enforcement outcomes. In an effort to improve upon processes and procedures while increasing transparency and working closer with our community stakeholders TriMet is forming a new Safety and Security Advisory Committee (SSAC). The SSAC is meant to be a broad-based advisory committee authorized by the General Manager. Working with the TriMet Transit Equity Advisory Committee (TEAC), the SSAC provides guidance to TriMet on issues related to operational safety and security. The SSAC analyzes and recommends appropriate changes to policies, procedures, and training for enhancing security throughout the TriMet transit network, including deployment of resources for increased security presence; fare and code enforcement for equitable treatment of low income and historically underrepresented groups, youth and other vulnerable populations; oversight of the Administrative Hearing process for TriMet Code violations; and monitors safety and security performance. Interested organizations are encouraged to contact John Gardner for more information. Community Advisory Council (CAC) for the Oregon Health Authority Office of Equity and Inclusion (OHA-OEI): The primary goal of the Community Advisory Council is to center Oregon’s community voices in OEI’s efforts to promote health equity and reduce health disparities. As advocates for vulnerable communities, the Community Advisory Council helps OEI proactively identify and address emerging and ongoing issues and opportunities. CAC members can expect to commit to two hour meetings every other month, with an additional two hours per month outside of meetings. Please see the attached Purpose Statement for more information and for member responsibilities. The Oregon Health Authority is especially looking for diverse geographic, demographic, and other representation within Oregon. Please complete and return the attached applicationto be considered. Applications and optional demographic sheet (REALD form) are due on Monday, May 21, 2018 at 11:59 pm to Allison Varga, OEI Community Engagement Coordinator (Allison.varga@state.or.us) or (FAX: 971-673-1128). This is a call for participation for BRIDGES alumni and current leadership cohort members to get involved in CCC’s Research Justice programming. Learn more about CCC’s Research Justice vision here. The following opportunities are for BRIDGES alumni and current leadership cohort members who primarily live, work, and or have spent a significant part of their life in Washington County. The Coalition has launched a community-based participatory research project about the lived realities of communities of color in Washington County. Part of the project includes the production of a research report that reflects the lives and aspirations of communities of color in Washington County. Each community report will be used to mobilize and advocate for better outcomes for culturally-specific communities in Washington County. Community reviewers: if you identify with any of the following communities and want to read the report before publication and provide feedback electronically and or through an in-person session. Contact Stefan Saing and Simeon Jacob by May 3rd. Slavic community review: Thursday, May 10 or Monday, May 14 6-8PM, Brookwood Library, 2850 NE Brookwood Pkwy, Hillsboro, OR 97124, Room B. Contact Lilya Yevseyeva by May 3rd. Contact Stefan Saing and Simeon Jacob by May 6th. Report presenters: CCC Research Justice and Advocacy programs will be coordinating a workshop at the end of May to train community members to testify and present the research findings to city councils, school districts, and others. Please contact Shweta Moorthy by May 15 if you wish to participate in this leadership development opportunity. Researchers in Regional Equity Atlas: a cohort of 12-15 community members living in Washington County will be resourced and trained through research justice workshops to design and implement small-scale research projects and co-develop an online equity tool along with our partners Ecotrust and 1000 Friends of Oregon starting in July 2018. Please contact Shweta Moorthy by May 15 if you wish to participate in this leadership development opportunity. Equity Facilitation Intensive: Leading conversations for racial equity, diversity and inclusion - Designed for individuals with leading equity, diversity and inclusion efforts within their personal and professional environments. The Center for Equity and Inclusion’s Equity Facilitation Intensive is an opportunity to foster personal growth and develop the facilitation skills-set needed to lead complex and often challenging equity and inclusion conversations, trainings, or coaching sessions. Apply today! When: July 9-13th, 2018 (9am-5pm); Follow-ups: 8/14, 9/11, 10/9, 11/6, and 12/4 (5:30pm-9pm); Interested applicants should be leading equity work in organizations/communities, have previous training with CEI, or have other relevant experience. Cost: $3,500 per person. Payment plans are available. Portland’s Bureau of Transportation (PBOT) has three job openings! Vision Zero Management Analyst – This is a data-focused role. Our partners at PBOT would love to secure candidates that have a “research justice” perspective to bring into PBOT. For more information about PBOT’s Vision Zero work and priorities, click here. Communications + Public Outreach Summer Interns– PBOT is especially interested in working with students and people who have skills in graphic design, web content management and or performing outreach to diverse communities (descriptions of these positions are coming soon, in the meantime, resumes can be forwarded to Irene Schwoeffermann, Public Involvement Coordinator at PBOT). Seasonal Maintenance Workers – these are entry-level positions that support our construction crews at job sites. On the job training is available and they have the potential to lead to long-term job opportunities! Potential applicants are encouraged to contact Irene Schwoeffermann to schedule informational interviews. This position will report to the Director of Diversity and Transit Equity and will work across the agency, divisions to leverage capacity and opportunities in partnership with TriMet's Community Engagement Team and staff to ensure agency efforts are effective, authentic, and meaningful. The duties of this position will include supporting ongoing program development, coordinating community and stakeholder engagement, and improving agency efforts to strengthen and expand relationships with key community stakeholders with a focus on transit-dependent populations. For more information, see the description for this position on the Bridges Jobs and Leadership Openings website. Consciousness Raising Facilitator/Consultants are responsible for raising consciousness, skills and internal capacity to advance equity, diversity, and inclusion within organizations. Facilitators frequently work in interracial teams but may occasionally individually lead workshops/ training for clients. These facilitators require an ability to thrive in a fast-paced, dynamic and engaging atmosphere where learning is paramount, self-reflection is critical and where no one day is ever the same! Kaiser Permanente Northwest (KPNW) Community Health Request for Proposal (RFP) Announcement. KPNW works in partnership with hundreds of community organizations to address the health needs and inequities affecting our Northwest neighbors. KPNW has announced a $630,000 Capacity Building Initiative. Washington: Clark, Cowlitz, parts of Wahkiakum* and Skamania* counties. Oregon: Clackamas, Columbia, Lane, Marion, Multnomah, Polk, Washington, Yamhill and parts of *Linn, and *Benton counties. *Organizations may email community.benefit@kp.orgto verify that they are located in a Kaiser Permanente service area. Step 1: Submit letter of inquiry via email, a maximum length of three pages per instructions on the template, by 5 p.m. PST on Monday, May 16, 2018. Please e-mail to Community.Benefit@kp.org. Step 2: Invited applications will be requested to submit a full application. See full RFP for detailed instructions.See attached RFP document and Letter of Inquiry template for full details and guidelines. The Coalition of Communities of Color (CCC) invites you to join us for the 4th Annual Bridges Convening for a day of networking, relationship-building, and discussions on cross-community issues and meaningful leadership! All current cohort and alumni members from the African American Leadership Academy, African Leadership Development Institute, Asian Pacific Islander Community Leadership Institute, LEAD, Slavic Leadership Development Project and Unid@s are invited and encouraged to attend. Breakfast and lunch will be provided. A hosted reception will follow from 4:30-6 PM. Stipends for childcare and travel will be provided with advanced notice. Attention Bridges alumni and current cohort members: Please register in advance and update your Bridges Profile in the Directory. Alumni and current cohort who have updated their profiles and are present during the reception, which immediately follows the convening, have a chance to win an iPad (one of two we have to give away!) or a $50 Visa gift card! Mary is currently the Director of Executive Appointments and Constituent Services in the Office of Governor Kate Brown. The Director engages with a variety of stakeholder groups across the state to identify qualified volunteers to serve on Oregon's over 300 boards and commissions. The Director recommends candidates for the Governor's selection and guides appointments through the Senate confirmation process. In addition to Executive Appointments, she manages Governor Brown’s Constituent Services operations and supervises team members who execute constituent responses. Mary moved to Washington, D.C. after graduating from college to be the Legislative Director for the United States Student Association (USSA) where she worked on national policy to increase access to quality higher education including the reauthorization of the Higher Education Act. After her time at USSA, Mary went to the Hill and joined the Office of Congressman David Wu as a Legislative Assistant where she worked on many policy areas including energy, transportation, natural resources, and education. Before joining the Governor's office Mary was the Director of Local and Federal Government Relations in Portland State University’s Office of Government Relations where she supported President Wim Wiewel’s vision and transforming work at PSU that resulted in a stronger urban serving four-year university in the heart of Portland. Mary is an Oregonian and a graduate of Portland State University where she received a Bachelor of Arts in Community Development. During her time at PSU, she was proud to serve as student body President and was often involved with advocating for higher education in Oregon’s state capital and in Washington, D.C.
Bridging cross cultural Leaders from cohort Classes of 2015-16! Over 100 leaders from the 2015-2016 Bridges programs came together on February 20th for the Second Annual Bridges Cross-Cohort Convening. Participants from the African American Leadership Academy, African Leadership Development Institute, Asian Pacific Islander Community Leadership Institute, Lead for Oregon, Slavic Leadership Development Project and Unid@s spent the day networking, building relationships and discussing cross-community issues and meaningful leadership. The convening was co-facilitated by trainers from Multnomah County’s Community Capacitation Center and alumni from each of the programs. On behalf of the CCC and BRIDGES, we would like to thank all those individuals that supported and participated in this year's convening. More pictures will be posted in an online gallery on the CCC's website. Our growing network of Bridges alumni will soon reach over 400 skilled community leaders! This summer the CCC will launch an online directory to honor andshowcase these individuals and their work in our communities. The directory will also act as a public resource for alumni to network with each other, for external stakeholders to view and contact leaders, and support connecting alumni with ongoing leadership opportunities in Oregon. For more information about BRIDGES please email Jessica Lee, Leadership Development Manager, at jessica@coalitioncommunitiescolor.org. CCC's Leadership Development Initiative's New Name and New Look! The CCC's Leadership Development Initiative is now known as BRIDGES: A Leadership Initiative for Oregon's Communities of Color! BRIDGES’ mission is to expand the capacity of communities of color to self-organize, network, build culturally-specific social capital, and develop our own pathways to equity. BRIDGES houses six culturally-specific leadership programs led by CCC member organizations and provides cross-cultural networking and support. Congratulations to the graduates of the 2014-2015 programs! Each year, leaders in the six culturally-specific programs collectively contribute over 12,000 hours of work, undergo 4000 hours of culturally-specific training, receive over 1300 hours of mentorship, and engage approximately 2000 community members through cohort-led action projects and campaigns. You can learn more about BRIDGES and stay updated through our new quarterly newsletter, Leaders Bridge, where we share program updates, leader spotlights, upcoming events and leadership opportunities to engage in our work and communities. For more information about BRIDGES or to sign up for the Leaders Bridge Newsletter please email Jessica Lee, Leadership Development Manager, at jessica@coalitioncommunitiescolor.org.